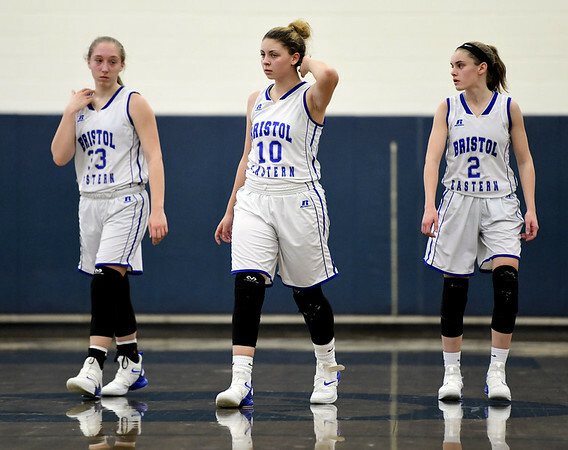 BRISTOL - Down 11-2 in the opening minutes of Saturday’s game, the Bristol Eastern girls basketball team knew it needed a quick turnaround to stretch its winning streak to four games. The Lancers (12-7) got that, responding with a 23-6 run over the rest of the first half to run away with a 57-40 win over Rocky Hill, giving Eastern plenty of momentum heading into its final regular season game against rival Bristol Central on Monday. Jordan Ouellette led the Lancers with 24 points, while Ciara Collins scored 11. Avery Arbuckle and Cali Doyon each added six, while Paige McLaughlin added five to pace the attack. Nikki Lukens scored 19 to lead Rocky Hill (8-11). Central’s Ramirez wins Class L 600 meters: Bristol Central placed sixth as a team in Friday night’s state Class L indoor track meet in New Haven, with the Rams’ Jose Ramirez placing first in the 600-meter run with a time of 1:24.76, just a fraction of a second ahead of E.O. Smith’s Nathan Metsack (1:24.95). Several Bristol Central athletes also placed in other events. The Rams’ 4x800 relay of Pacifico Flores, Mark Petrosky, Devin Flores and Ramirez placed second in 8:18.22; while Hunter Peterson placed third with a leap of 20 feet, 5 inches in the long jump. Bristol Central’s Austin Freve placed sixth in the 1,000 meters (2:43.85), while Petrosky was sixth in the 3,200 meters (9:48.02). Bristol co-op beats Lewis Mills: The city co-op improved to 7-1 for the season with a win over visiting Lewis Mills on Friday. Bristol swimmers picked up 17 best times in the meet. First place finishers were Colton Litwinczyk in the 200 freestyle, Gabriel Bartolome in the 200 IM and 100 breaststroke, Anthony Fasci in diving, Mikel Palaj in the 100 butterfly and 100 backstroke, Noah Taylor in the 100 freestyle; plus the 200 medley relay (Stafford, Bartolome, Palaj and Taylor) and 400 freestyle relay (Palaj, Taylor, Bartolome and Litwinczyk). Anthony Fasci (best lifetime diving score), Michael Bond (100 butterfly), Jason Kosciukiewicz (100 butterfly), Jason Gilkes (100 breaststroke), Jack Alling (100 freestyle), Kurt Miskell (50 freestyle), Parker Dayton (200 IM), Jordan Northup (200 freestyle) and Joseph Guerin (200 IM and 100 breaststroke) all had best times in their events. “It has been a great year and they are a bunch of great guys. It has been awesome working with them and watching them reach their goals,” coach Adrienne Bentley said. Terryville 48, Thomaston 41: Colin Bamrick and Albert Molina each scored 11 points as the Kangaroos won on the road on rival night. Freshman Dominick Dao sparked the Kangaroos off the bench with seven points, six assists and five rebounds. Terryville moves to 5-11 on the season and needs to go 3-1 the rest of the way to qualify for the state tournament. “We’ve got a few games left and were trying to make one last push to play some good consistent basketball,” he added. Chad Suckley led Thomaston with 14 points. Naugatuck 61, St. Paul 54: Having already clinched a state tournament berth, the Falcons were unable to improve their seeding on Friday night, suffering a 61-54 loss at Naugatuck. The Falcons (8-10) were led by Noah Waters (16 points), Donavan Symes (16) and Tyler Garry (11). Naugatuck (14-4) was led by Andrew Robertson (18 points) and Avery Hinnant (10). Posted in The Bristol Press, Bristol Central, Bristol Eastern, St. Paul, Terryville on Monday, 11 February 2019 17:33. Updated: Monday, 11 February 2019 17:36.